Next few days looking interesting and then all next week sun, sun and sun. Did a good N facing ski tour on Thursday and scored cold fresh untracked from only 1,600m to 2,200m then Friday was warm and sunny and then I took a couple of others on the same tour and snow was nowhere near as good, not helped by flat light. We're now waiting for the snow to start, radar predicting circa 14:00 but we'll be in the bar warming up at 15:30 for a certain rugby match. So will be interesting to see what he's proposing come Thursday with the warm temps though sure he'll still be finding the good stuff. @telford_mike, Constant thaw and temps up to 10c in the valleys? A total nightmare. @staffsan if you are going at half term, as I am, I would not stress about the forecast for sun with slightly mild temperatures. It is the busiest week of the year so the last thing you want is snowy weather which results in nightmare traffic jams / journeys to / from resort, most lifts closed and pistes which are open over-crowded, mogulled carnage. Fine weather with the great snow base will mean better journeys and much more ski-ing on less busy pistes. Also, even if the current forecast does materialise, skiing above 2000m should be slush free and lovely conditions most fo the day. I suspect the week commencing 17 Feb will turn out a bit less sunny and cooler that some of the computer generated models are suggesting at present. There are some really weird and unlikely outputs such as the BBC showing BSM at 850 metres altitude hitting 18 degrees C while Nice at sea level is 4 degrees cooler. SLF forecast for Switzerland tomorrow. 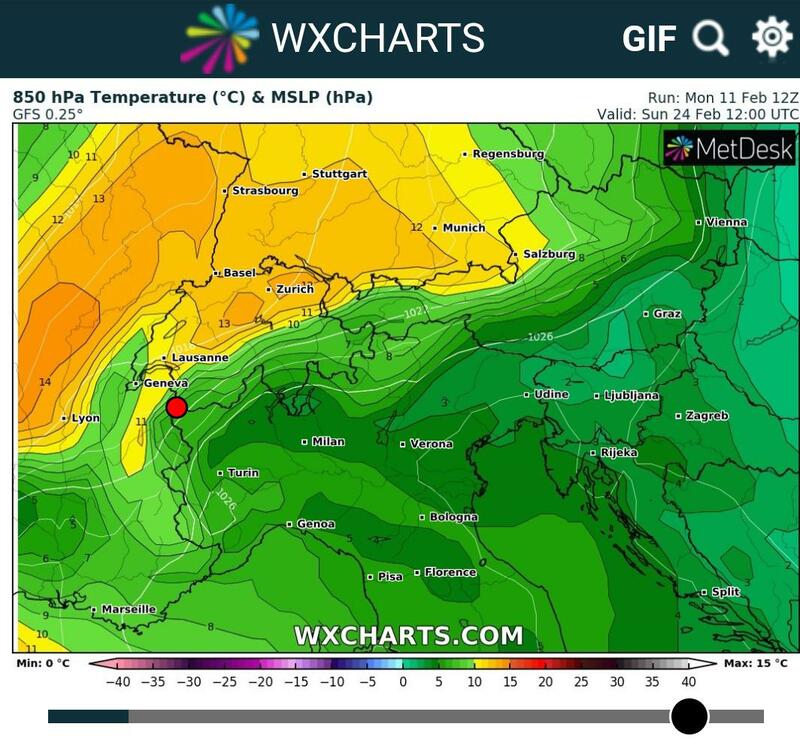 ”Skies will be heavily overcast, frequent snowfall is anticipated, particularly in the Lower Valais, on the northern flank of the Alps and in northern Grisons. Only in central Ticino and Sotto Ceneri will be it predominantly sunny. central Ticino and Sotto Ceneri: 5 to 10 cm. At midday at 2000 m, -9 °C. on the Main Alpine Ridge and southwards therefrom, blowing at strong to storm-strength; penetrating northerly winds during the afternoon in the Ticino will extend down to low lying areas. During the morning in the eastern sector of the northern flank of the Alps, the final snow showers of this period of precipitation will fall. In the other parts of eastern regions it will be partly sunny, in the remaining regions of Switzerland predominantly so. In general at high altitudes and on the southern flank of the Alps, a strong to storm-strength northerly wind will be blowing and penetrate down to low lying areas. The avalanche danger levels in outlying terrain away from secured and marked ski runs will remain critical over widespread areas. Temps, not that cold minus -1 but uber strong winds with intense wind chill and resultant black ice crazy ! Hmmm, 18z has produced an interesting option in just over a week. 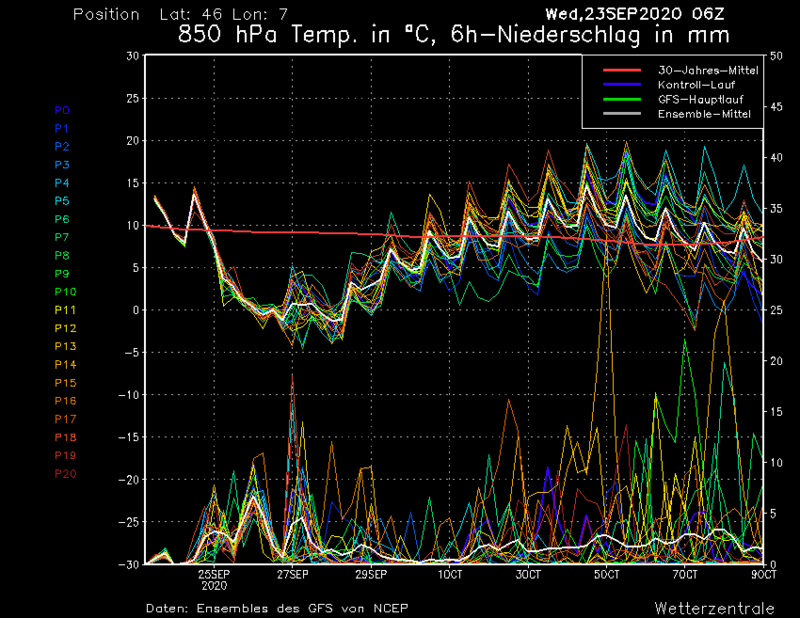 That would be cold and snowy for the Alps. Be interesting to see if that is still there in the morning. Seems to have backed off on the snow now, but significantly colder 16-18th, which is also nice! 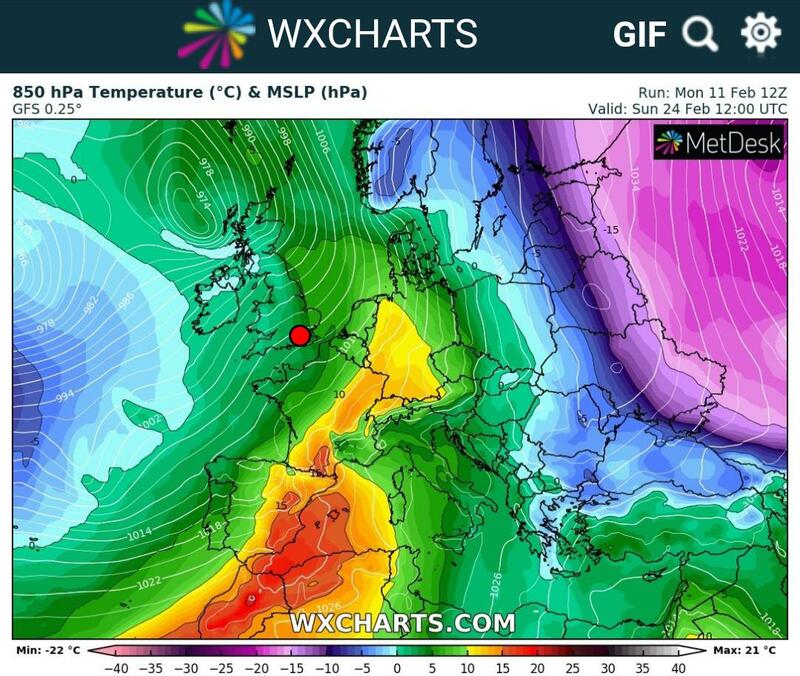 Lets see if ecm follows soon. Why’s my ensemble link stuck on 4th Feb? Just me?? @Dashed, Nope, mine is the same, seems to be bust, but it has done this in the past. Yes sadly the link to the specific graphic file appears to have stopped working, anyone know if it is an error or a conscious decision to switch that off? Arriving in St Anton on the 23rd. Concerned that the snow won't last considering the forecast for warm temps over the next 2 or so weeks with little sign of snow after the current event. Am I just being paranoid? Has anyone skied the Arlberg in spring like conditions? Thoughts / comments? Yes you are being paranoid, it'll be fine, enough snow to last until the end of season already. Spring snow is 2nd best to fresh powder IMHO. Follow the sun as it warms the slopes, then head back to Northern facing slopes if it gets really hot! Although the F/L for this weeks seems to be 1900m so no issues at all. @Don87, you do know that Austria had its biggest ever snowfalls just a few weeks ago? If there was not another flake, and if it was 25 degrees every day you will still have snow...plenty of snow. Hahaha. Okay good to know! Thanks... I will stop worrying now. We got another 30 - 40cm today and it is still snowing now. I think tomorrow’s snow report will show a depth of better than 370cm on the Galzig. No, there is absolutely no chance that you will run out of snow. The quality is an unknown, but the quantity is not in question. After the snowfall clears through the weather this week is going to become increasingly warm and mild. Shade selection and ensuring you have the right aspect facing everyone else on the terrace will become increasingly important. Does anyone have any tips for someone who will never learn to like slush and will be in the Chamonix the next couple of weeks? I mean even there skiing is limited over 3000m, which seems to be almost as high as FL will be some days. Get skins and head for north faces? Would i be better off heading east to maybe some place like Zermatt, or even to higher resorts in Austria? Or should i just get this trip over with so i can forget it and start planning the next, promising to never ever go outside of january again? What is all this talk of slush ? @staffsan, stop worrying. Ski, enjoy the weather and the mountains. I do love the description from chamonix meteo for thursdays weather though - "outstandingly fair"
I propose that @staffsan be appointed the honorary 'Lance Corporal Jones' of the 18/19 Weather Outlook thread. Well the old adage of ‘you can’t please all of the people all of the time’ certainly applies to staffsan. It doesn’t seem to matter what anyone says in appeasement and it’s been going on for days and pages now. Boring. There’s tonnes of snow and it’s going to be sunny and warm. You missed - cancel and book either Lake Tahoe, California or Jackson Hole in Wyoming and not see the sun at all and literally drown in powder ... can you ski powder ?! I shall be cruising the Arlberg in between eating my body weight in local food ! at the risk of getting slightly off topic. Just worry about the things you can affect. 5) Enjoy. For me it's always better that the office. ALWAYS! The closed slopes , cold wind , digging out the car , avi danger , trying to find space inside the mountainside restuarant , loads of layers , weather delayed transfers and cancelled flights etc etc will be a distant memory . If lovely smooth soft spring snow, endlessly grippy pistes, and cold beers on warm sun terraces surrounded by mountains sound that awful to you, maybe donate the trip to someone who will appreciate it and go to Milton Keynes instead. I hear they maintain consistent temperatures. What clarky says. Its going to be sunny. There isn't going to be any fresh. If you don't like it, don't bore us with the constant moaning. I don’t actually believe it’s going to be that hot next week , yes very nice in the afternoon on the sunny slopes but cold nights and still cool on shaded slopes . Too much over reaction going on . 1. Learn to make the most of whatever conditions you encounter. Some of that is about technique, but mostly it is about the attitude you adopt. 2. The best solution to the problem of ensuring you get a perfect week's skiing every year is not about the resort, the country or the month. It is to take more skiing holidays a year!